Investing can be done through several ways such as mutual fund, exchange traded fund (ETF), closed end fund (CEF), individual stock or bond, certificate of deposit (CD), money market etc. Some may be riskier than the others. Investing in CD or money market is safer, though the return is limited. Investing in foreign stock may be riskier, though the return can be enormous. Individual investor need to pick and choose the right combination for better investment portfolio. This can be done through diversification into several different classes such as bonds or stocks. The simplest way to invest is by investing in mutual fund. Mutual fund consists of variety of holdings whether it is stock fund or bond fund or balanced fund (i.e. hybrid fund). Large portion of stock fund usually invest large cap companies fund. This large cap fund is part of US domestic stock fund; it can be divided into three categories such as large growth, large blend, and large value. This article will look into large growth fund. Large growth fund is a fund whose objective is to achieve appreciation of capital by investing in growth stocks of large capitalization companies. These growth companies usually have significant earnings and revenue growth. The list is compiled from variety of financial websites and magazines such as Morningstar, yahoo finance, Kiplinger, msn money, etc. 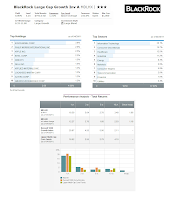 The 15 Top Performer Large Cap Growth Mutual Funds up to May 23th, 2011. Details about the funds information can be found in below table. As part of DundeeWealth Funds, the Dynamic US Growth fund is the top performing fund in Large Growth category with 13.25% YTD return. This Dynamic US Growth investment seeks long term appreciation of capital. The fund invest most of assets (>80%) in US growth companies equity securities. It may invest in companies of any size such as small and mid capitalization companies. It may have large exposure in one or more economy sectors such as information technology sector. This large growth stock mutual fund is managed by Noah Blackstein since 2009. This DundeeWealth fund is rather small with $54 million total net assets. As part of no load fund, this fund doesn’t have any front end sales load and deferred sales load. The fund’s expense ratio is 0.90% per year. The fund does charge a 2% fee for redemption or exchanges within 90 days of purchase. As of April 2011, the fund has 26 holdings. The fund benchmark is Russell 1000 growth index. The top 4 fund sectors are information technology (49.1%), consumer discretionary (32.6%), health care (10.8%), and consumer staples (7.6%). Top 10 holdings of Dynamic US Growth fund are priceline.com Inc (5.59%), Informatica Corp (5.18%), Alexion Pharmaceuticals Inc (5.07%), Juniper Networks Inc (4.95%), Acme Packet Inc (4.88%), EMC Corp (4.87%), Aruba Networks Inc (4.80%), Riverbed Technology Inc (4.28%), Fortinet Inc (4.27%), and Under Armour Inc (4.24%). This Smith Group Large Cap Core Growth fund is another DundeeWealth Funds. This fund’s aim is to provide long term capital appreciation. The fund usually invest majority of assets in US common stocks and other large capitalization companies equity securities with high earning growth rate based on sub advisor judgment. John D Brim is the current fund manager. This fund is sub advised by Smith Asset Management Group. The fund annual expense ratio is 0.79%. There is no management fee (12b1 fee) and no sales load fee. Investor may need $10,000 initial investment to invest in this fund. 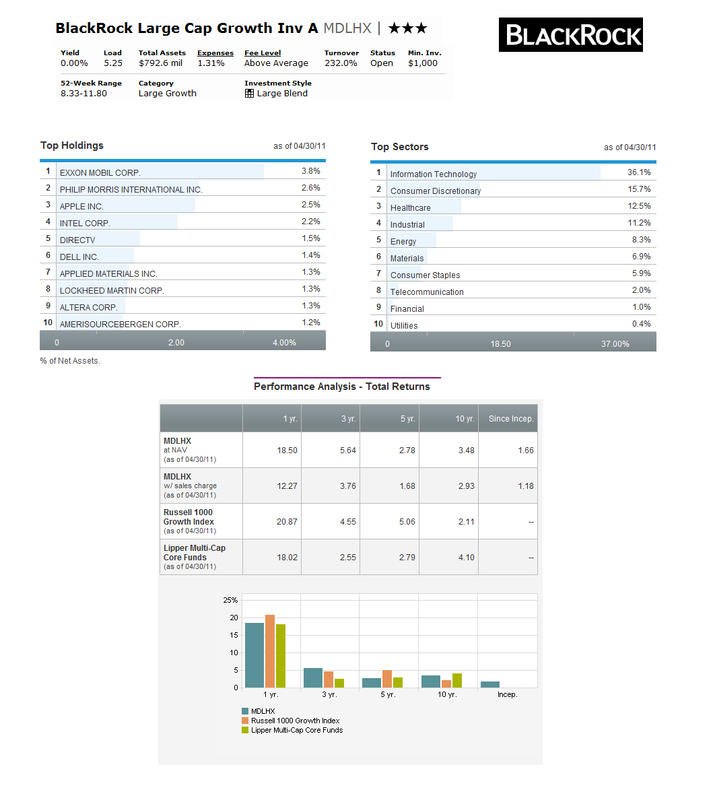 This top performer mutual fund has YTD return of 11.15%. Over the past year, it has returned 26.39%. The fund also has 2 stars rating from Morningstar. The fund’s beta (3 years) is 0.92. This fund can be bought from several brokerages such as Pershing FundCenter, JPMorgan, Schwab, Scottrade, TD Ameritrade, Matrix Financial Solutions, etc. The top 10 industries of this large growth equity fund as of April 2011 are software (7.7%), oil gas & consumable fuels, specialty retail, machinery, energy equipment & services, pharmaceuticals, internet software & services, consumer finance, capital markets, and health care providers & services. The fund weighted average market capitalization of $48.3 billion. The top 10 holdings include Whole Foods Market Inc (3%), MetroPCS Communication Inc (2.8$%), TIBCO Software Inc, Helmerich & Payne Inc, priceline.com Inc, Endo Pharmaceuticals Holdings Inc, Check Point Software Technologies Ltd, Limited Brands Inc, Halliburton Co, and Corn Products International Inc.
First Investors Select Growth fund is seeking long term capital growth. This fund invests in a portfolio of approximately 40-45 common equities that offers the best potential for earnings growth with the lowest risk of negative earnings surprises according to its fund’s subadviser. This fund is suitable for long term investor with moderate investment risk. The fund has been managed by Eivind Michelle Olsen since March 2009. The expense ratio of this First Investors fund is 1.56% per year and is higher than 1.31% category average. This fund also charges a front end sales load of 5.75%. If you are interested in low fee of this First Investors fund, you can invest in other fund classes include FICGX.lw (load waived class) and FIGBX (Class B). These classes may offer lower fee and slightly higher performance. The fund best 1 year return occurred in 2003 with 32% return. The worst performance is -41.77% in 2008. As April 2011, the top sectors of this fund include information technology (23.2%), consumer discretionary (15.9%), health care, financials, energy, industrials, materials, consumer staples, telecommunication service (2.7%), etc. 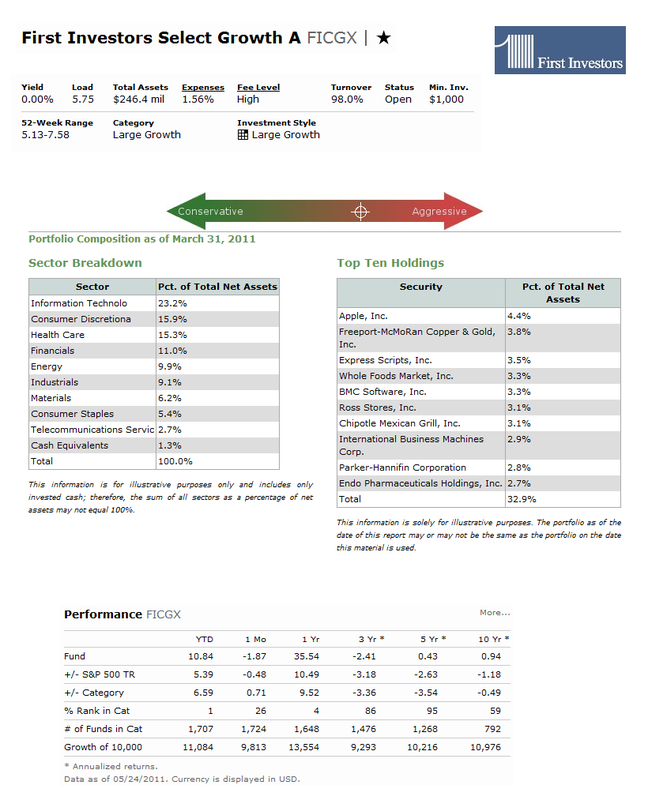 The top 10 security holdings are Apple Inc, Freeport-McMoRan Copper & Gold, Express Scripts Inc, Whole Foods Market Inc, BMC Software Inc, Ross Stores Inc, Chipotle Mexican Grill Inc, International Business Machines Corp (IBM), Parker Hannafin Corp, and Endo Pharmaceuticals Holdings Inc.
As one of the smallest fund in this Top Performers list, GMO US Growth fund objective is to seek long term growth of capital. The fund will try to outperform its benchmark index, the Russell 100 Growth Index. The fund will invest directly or indirectly in equity investments. Since 2005, Sam Wilderman has been the lead manager of this GMO fund. This large growth fund has net expense ratio of 0.76% per year. As part of no load fund, there is no sales load. The fund also has a yield of 0.67%. The fund annual holdings turnover is 61%. It also receives 4 stars rating from Morningstar. The fund has returned 5.66% over the past 3 year, and 3.37% over the past 5 year. Only limited brokerages offer this fund such as CommonWealth PPS, Fidelity Institutional FundsNetwork, Thrivent Advisory Eligible, etc. As November 2010, the fund top 8 holdings include Apple Inc (6.49%), GMO US Treasury (4.43%), Exxon Mobil Corp, PepsiCo Inc, Johnson & Johnson, Google Inc, International Business Machines, Microsoft Corp, and Procter & Gamble Co. This is one of two highest rated funds in this Top Performing Funds list, Wells Fargo Advantage Growth fund received 5 stars rating from Morningstar. This Wells Fargo Advantage Growth fund seeks long term appreciation of capital. The fund usually invest more than 80% of total assets in equity securities and <25% of total assets in foreign issuers equity securities (ADRs). The fund will invest in companies with prospect for robust and sustainable growth of revenues & earnings. This fund may use futures, options or swap agreement, and derivatives to enhance return and to manage investment risk. 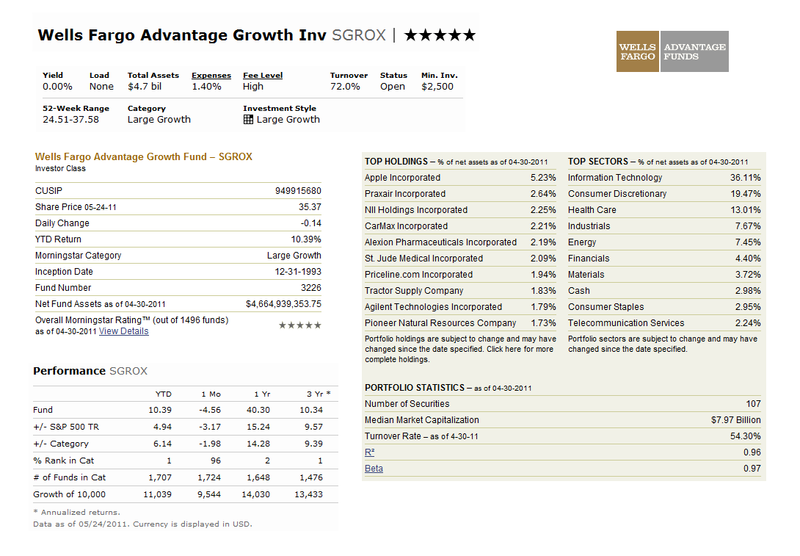 This large growth stock fund is managed by Thomas Ognar since 2002. The fund total net asset is $4.66 billion. It also has an annual expense ratio of 1.36%. This investor class fund doesn’t have any load fee. Other classes of this fund are Class A (SGRAX), Class A with Waived load (SGRAX.LW), Class C (WGFCX) , Institutional Class (SGRNX), and Administrator Class (SGRKX). Some of these classes may charge lower expense fee, please check with your fund brokerage for details. To invest in this Wells Fargo Advantage fund, you will need $2,500 minimum initial investment for brokerage account. The fund YTD return is 10.39%. The fund has returned 35.77% over the past year, and 12.51% over the past 3 year. This fund also has an outstanding performance over the long term period. The fund returned 5.98% over the past decade. The best performance was achieved in 1999 with 75.06%. The fund top 10 holdings are Apple Inc (5.23%), Praxair Inc (2.64%), NII Holdings Inc (2.25%), CarMax Inc (2.21%), Alexion Pharmaceutical Inc (2.19%), St Jude Medical Inc, priceline.com Inc, Tractor Supply Co, Agilent Technologies Inc, and Pioneer Natural Resources Co (1.73%). The top 6 sectors include information technology (36.11%), consumer discretionary (19.47%), health care (13.01%), industrials (7.67%), energy (7.45%), and financials (4.40%). BlackRock Large Cap Growth investment objective is to achieve capital growth over long term period. The majority of fund assets are invested in equity securities included in the Russell 1000 Growth Index. 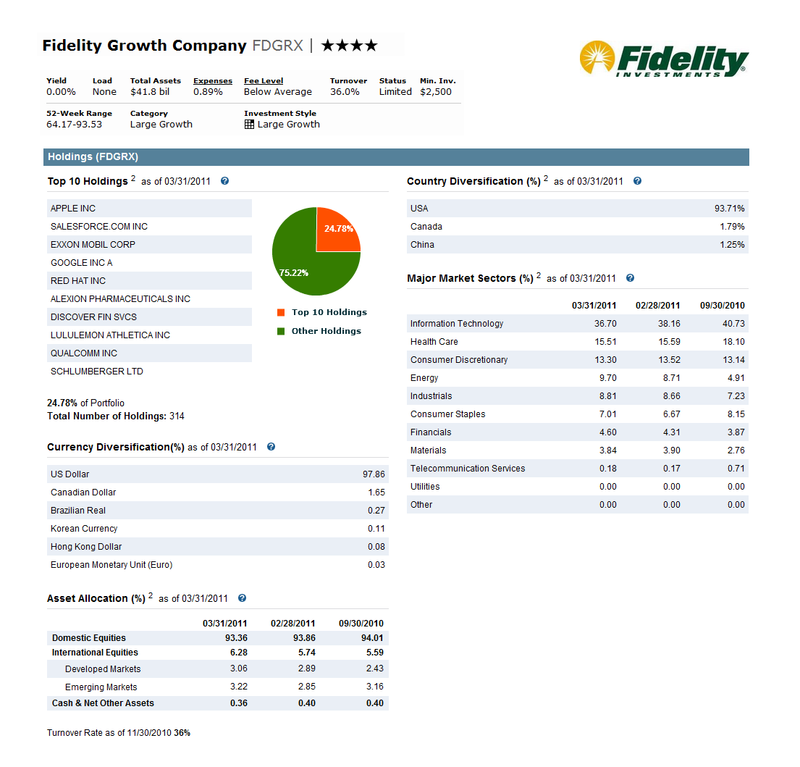 This fund is a feeder fund that invests all of its assets in Master Growth Portfolio, a series of Master Large Cap Series llc having the same investment objective and strategy as the fund. Since October 2010, the fund manager is Peter Stournaras. This Class A fund does charge a front end sales load of 5.25%. The annual expense ratio of this fund is 1.31%. The fund has returned 3.76% over the past three years and 2.93% over the past decade. As of May 2011, the fund top holdings are Exxon Mobil Corp, Philip Morris International Inc, Apple Inc, Intel Corp, DirecTV, Dell Inc, Applied Materials Inc, Lockheed Martin Corp, Altera Corp, and Amerisourcebergen Corp. The top 8 sectors of this BlackRock fund are information technology (36.1%), consumer discretionary (15.&%), health care, industrials, energy, materials, consumer staples, and telecommunication (2%). The Columbia Select Large Cap Growth fund is seeking long-term appreciation of capital. The fund most of the time invests >80% of net assets in common stocks of U.S. and foreign companies with market capitalizations in the range of companies in the Russell 1000 Growth Index at the time of purchase. The fund may not concentrate its assets in any single industry but may invest >25% of assets in companies in the health care and technology sectors, respectively. It may invest in derivatives, futures, options, forwards, swap contract to enhance the portfolio value. This domestic stock fund is managed by Thomas Galvin since February 2003. You will need $2,000 initial investment to invest in this Columbia fund. The expense ratio of this Columbia Select Large Cap Growth fund is 1.26%. It also charges 5.75% front end sales load. To invest in no load fund of this fund, please check other classes such as Class C (ELGCX), Class R (URLGX), Class Z (UMLGX), Inst Class (CSPIX), and Other Class (CSLWX). Morningstar rated 3 stars rating for this Columbia fund. Based on load adjusted return, the fund has returned 23.90% over the past one year, and 6.27% over the past 5 year. 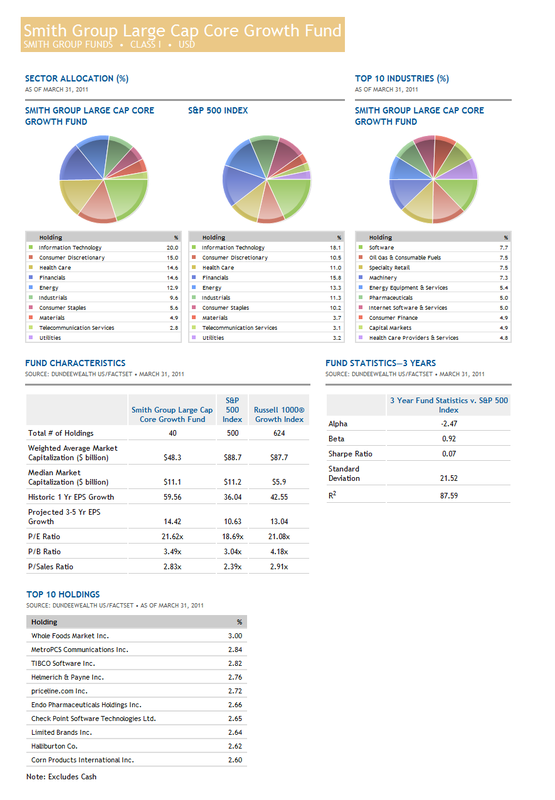 As of May 2011, the fund top 15 holdings include Amazon, Baidu, Salesforce, Franklin Resources, Cognizant Techonolgy Solutions, Allergan, EMC, Medco Health, Qualcomm, Precision Castparts, Chipotle Mexican Grill Inc, Priceline, F5 networks, Novo Nordisk A/S, and Celgene. This fund may be closed to new investor. If you have invested in this fund, you can continue investing as usual. 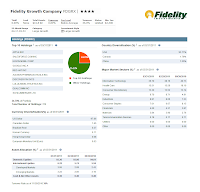 The Fidelity Growth Company fund seeks capital appreciation. The fund invests primarily in common stocks such as domestic and foreign companies. It usually invests in above-average growth potential companies. The fund is managed by Steven S. Wymer since 1997. The annual expense ratio is 0.89%. This fund has total net assets of 41.8 billion. The fund has returned 25.11% over the past year and 6.94% over the past 5 years. There is no Front End Sales Load and no 12b1 fee for this actively managed fund. The fund has its best 1 year return in 1999 with 79.48%. 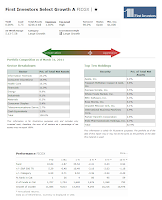 Morningstar awards 4 stars rating for this Fidelity fund. As of April 2011, the top 6 largest major market sectors include Information Technology, Health Care, Consumer Discretionary, Energy, Industrials, and Consumer Staples sector. Top 10 largest equity holdings of this fund are Apple Inc, Salesforce.com Inc, Exxon Mobil Corp, Google Inc, Red Hat Inc, Alexion Pharmaceuticals Inc, Discover Financial Services, Lululemon Athletica Inc, Qualcomm Inc, and Schlumberger Ltd.